So despite not going all out on the decoration, I did learn a lot from icing this cake. Ice the bottom. Even before I had finished this was obvious to me, the top of the cake was lumpy from the cherries and other fruits. Not even two layers (marzipan and icing) could cover the “cellulite” on this cake. Ribbons cover a multitude of sins. The sides on my cake were relatively flat, with only one or two join marks, however a nice wide ribbon would cover this. Plus it really would have looked more festive. Unfortunately I don’t have a ribbon drawer, so for next year I will have to find out where you even buy ribbons from! Buy pre-rolled icing. This is one I did, thankfully, as I realised as I was unrolling it that I don’t actually have enough work-surface to roll out the dimensions of icing needed to cover this cake! At least not without moving so much stuff that I am dismantling the kitchen! Decide on how you decorate it before you start. It seems obvious now but I was standing there in my small kitchen with one newly iced cake, an hour left before heading out and no idea what to do with it next. So after all the time collating pins for inspiration, I took the stuff I had in my kitchen as inspiration: green food dye, christmas tree cookie cutters and those silver balls. Not hard to see how I came up with a Christmas tree is it? Why to use apricot jam. For my cherry and chocolate christmas cake I thought that cherry jam would be better than apricot jam which is almost universally used to stick marzipan to the cake. Cherry matches the flavour of the cake so it has to be the best choice, right? Well I am not sure I would bother, there is not enough jam on the cake so that you notice the taste, and to be honest it doesn’t have the visual appeal of the apricot. Have you ever while eating fruit cake noticed the jam that glues the cake to the marzipan before? Well I hadn’t until I saw the strange red/purple staining of the cherry jam, which is to be frank – is just plain wrong. To be honest I was starting to think it would be a total wipeout for all my 2012 goals, as I definitely haven’t made any of the breads I wanted, become even slightly more vegetarian, locally minded or baked profiteroles. Although I have made pasta (I have a new pasta machine) but I haven’t posted the photos yet, you have that to look forward to in 2013! As for the cake, I think the chocolate and cherry worked well together the taste was great, however I think I either should have feed the cake more – or cooked it less. The cake in the middle was fairly crumbly and it made a fair amount of mess. 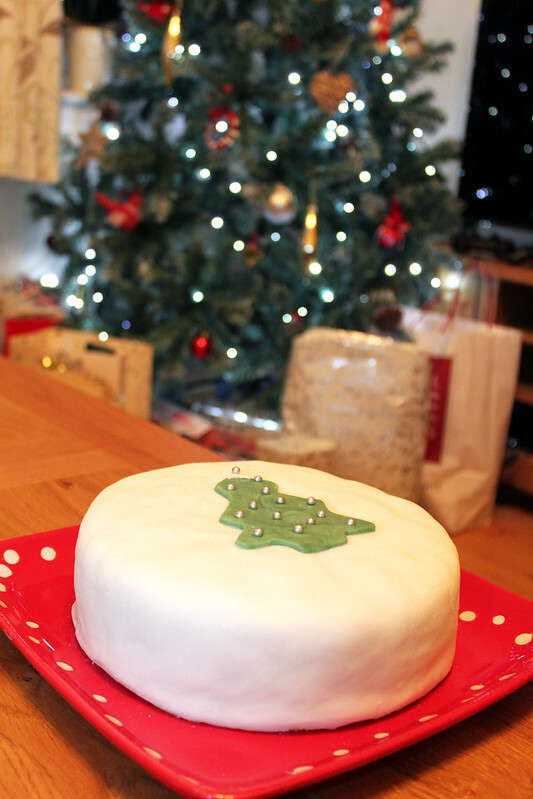 However despite all the problems I am super proud of my Christmas Cake, and it proves no matter how many books, blog posts and recipes you read, you truly learn by doing not reading. Wishing you all the best for 2013 when it comes to you!